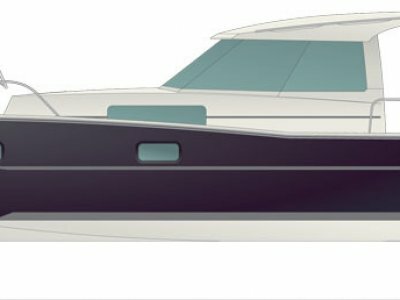 Continuing the tradition of economical displacement motor cruisers, initiated with the Delphia Escape 1350, followed by the 1050 and the more sporting orientated 1080S, the 800 is now available. The easily driven hull, producing very little bow wave at cruising speeds, has allowed the use of small horsepower diesel engines or moderate horsepower outboard engines, making the fuel consumption very light and assisting in weight reduction, with the option of further reduced operating costs by making the boat trailerable. I would think this would be the most spacious 8m trailerable boat available, with 2 double bed cabins, enclosed head with toilet and shower, dinette, galley. This is a great family weekender or fisher, offering the opportunity to enjoy spending time out on the water exploring our harbours and rivers. 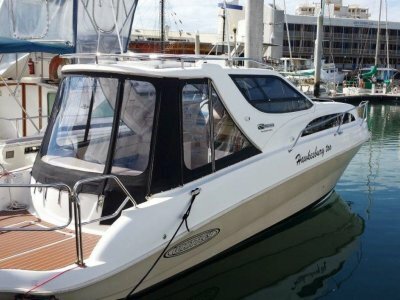 A moderate purchase cost and exceptionally low running costs makes this boat good buying and ideally suited to young families. Very affordable, comfortable and spacious. Handlaid fibreglass construction ensures a strong, good quality hull for strength and durability. N. B. Some of the photos show the optional foredeck helm pedestal----this is not standard equipment. Diesel inboard or petrol outboard engines options are available. Nanni 14hp or 21HP Diesels, super economical and reliable, or a 25HP outboard. The suggested pricing on this boat is with the 21HP Nanni, with 70 litres diesel tank, and this is the highest price engine option. A price reduction will occur if you chose the outboard option. Engine room: Hydraulic or cable steering. 70 litres diesl or 25 litres petrol. 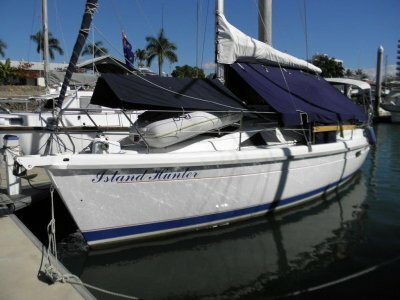 Double bed aft, double V berth forward. Saloon with dinette, enclosed head, galley, striped flooring similar to teak and holly, light and bright interior features beech coloured woodwork and joinery. Forward cabin with double bed, hanging locker and shelving. Enclosed head in moulded fibreglass with toilet and shower. Aft cabin has a double bed and hanging locker. Dinette can convert to a bed utilising backrest cushions. 12V macerater with holding tank. Sink, 2 burner cooktop, storage space and shelves. 12V Quick anchor winch, Delta 6kg anchor, 45m x 6mm galvanised chain. 12V bilge pump, manual bilge pump, fire extinguisher, horn. Remainder of safety equipment, flares, epirb etc to Australian standards to be supplied at cost at time of delivery. 100AH house battery, master electrical switch panel with gauges for battery voltage, water and fuel levels. Master battery switch. Led cabin lighting. Led navigation lighting. 12V power socket at switch panel. 25amp battery charger, Fusion 205 stereo with am/fm/vhf, ipod, usb and 2 speakers. Compass, Lowrance VHF transmitter with DSC and antenna, Lowrance HDS7 touchscreen gps/plotter. Fishfinder combo. Touchsvreen with built in GPS antenna. Pullpits, pushpits, stanchions with single lifeline, 4 x mooring cleats, LED navigation lights, anchor locker, 2 x stern lockers, opening hatch in head, stern gangway with ladder and handrail. Locker for gas bottle. Hardtop cover for wheelhouse/cockpit with panoramic windows, opening hatch in saloon, above table, opening hatch in transom for aft cabin, opening hatch in front windscreen, small opening window in side pane beside helm, handrails above companionway. 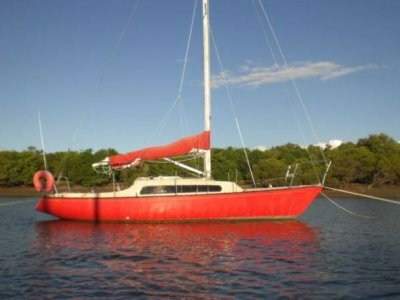 With the option of this boat being trailerable a greater flexibility of cruising or fishing grounds are available. Extensive option list can allow you to build the boat as you want it. A huge fuel bill with a fst boat can take the fun out of being on the water. The Escape range of economical powerboats is the answere.